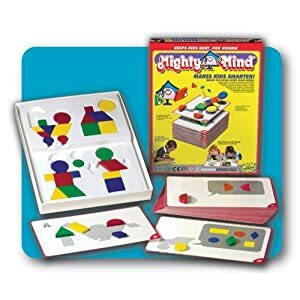 This is a fun activity that really encourages kids to think about the attributes of 3-D shapes.It also integrates science and makes kids think about how the shape of an object affects how it moves. It's super easy. 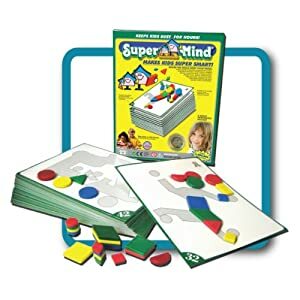 Just prop up a flat surface (we used dry erase boards), give the kids a variety of 3-D shapes and let them go! I encourage the kids to make predictions and explain their thinking before they roll, slide or stack. For example, "I think the sphere will roll because it is round all over," or "I think the cube will slide but not roll because all of its sides are flat." After the kids have had lots of time to explore, they fill out a recording sheet for their journal. Then we discuss! What different attributes helped or stopped the shapes from rolling/sliding/stacking? Would it be a good idea to make a car with cone-shaped wheels? What about a sphere-shaped soccer ball? This one is 2-steps...count and then compare. This one is fun...there could be multiple answers. A cube and a cylinder? Or a pyramid, a cylinder and a cone? I love this one...can you read it? SALANDR (cylinder) AN (and) RAGELR RAZAM (rectangular prism...I think!). This one is very challenging. Again...it has more than one possible answer. Is it a cube and a cone? Or a pyramid and a cylinder? 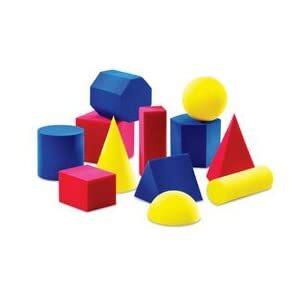 For most children, learning about shapes is one of their earliest learning experiences--their preschool years are filled with shape games, puzzles and sorting toys. Hence, they come to school with a great deal of background knowledge already. As kindergarten teachers, it is our job to build upon and extend that knowledge. I really want my kids to explore and think about shapes in ways they never have before. So we spend time manipulating concrete models, and then we talk about them--a lot! I'm not overly concerned that kids memorize facts about shapes and then regurgitate them on command. I have found that this happens naturally as we explore shapes through hands-on learning and problem-solving. I'm not afraid to talk about/explore things that are beyond traditional kindergarten expectations--especially if the kids are the driving force behind it. I just try to frame it in a way that kindergartners will understand by connecting it to things they already know. I use math vocabulary and everyday language interchangeably. I want my students to have something to relate new knowledge to, but at the same time, I would like them to be exposed to formal math language. A great example of this is corners/vertices. Kindergartners know what corners are and can easily identify them on a shape--but the correct word (and the word they will be using as they move through school) is vertex. Although I may use this language, I don't expect my students to memorize it. Here is an anchor chart we created in my class this year. It took us several days to create. We talk about what the shapes look like, how many sides/corners they have and where we might see them in the real world. We spend a lot of time comparing shapes--How are they the same? How are they different? We generally do one of these charts per day (it only takes about five minutes and can usually be done at the beginning of math or during calendar). We also do shape sorts. We usually do these whole group so we can talk about it. But you could also do them in math notebooks. I like to do a triangle/not triangle sort so that kids understand that triangles can look different--they can be long and skinny or short and fat--as long as they have 3 straight sides! 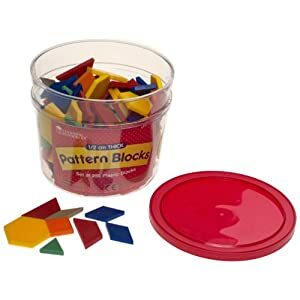 We free explore with pattern blocks and other shape manipulatives. I talk to the kids and ask lots of questions as they "play." I challenge them to create shapes from the pattern blocks. We look for shapes in the real world and record them in our math notebooks. We also make class books about shapes. We make shapes. One of the best ways for kids to understand the attributes of shapes is by creating shapes themselves. For example, they are going to need 3 popsicle sticks to make a triangle...or 2 short sides and 2 long sides to make a rectangle. We use popsicle sticks, geoboards and Wikki Stix. I also like to give them a piece of string tied in a loop to see what shapes they can make from it. We draw shapes. Again--when drawing shapes, kids really have to think about them. Will they need straight lines or curved lines? Are the sides all the same length or different lengths? We use shapes to make pictures (we like robots!). 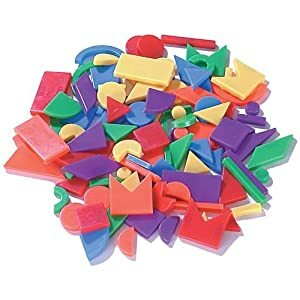 I keep a good supply of die-cut and punched shapes in the art center for my kids to create masterpieces with. 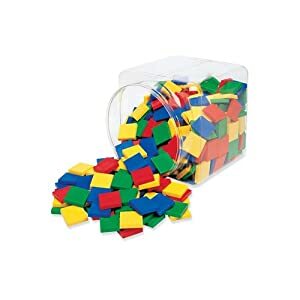 You can extencd this activity by having the kids record how many of each shape they used in a graph. Next up-- Geometric Solids. Check back soon! Here is the first week of my Shapes Unit. 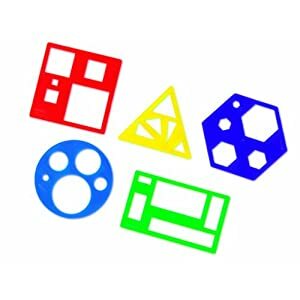 These are just the problems--I do lots and lots of other activities to get the kids exploring and really thinking about the attributes of shapes. I will detail specific activities tomorrow in a warm-up post. 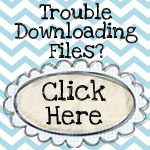 But for now, here are some problems! This is a very hands-on unit. 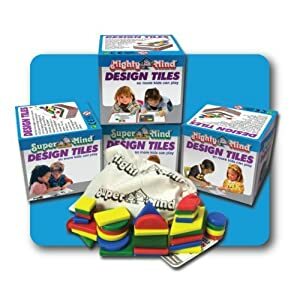 I provide my students with lots pattern blocks and other shape tiles so that they can explore and manipulate shapes in a very concrete manner. For this problem, I give each student a blackline master of a circle and some colored square tiles. I challenge them to fill the circle completely with the square tiles. They cannot overlap the tiles and they must cover the circle completely--no white spaces left. They will try and try and try--but despite their best efforts, they are unable to complete the challenge. The most important part of this problem is the discussion that occurs during and afterwards. Why can't they fill the circle with the square tiles? They will inevitably come to the conclusion that they cannot fill the circle with squares because squares have straight edges and circles have a round edge. I then challenge the students to use the square tiles to see what shapes they are able to make. They quickly discover that they can make different sizes of rectangles and squares. And they try and try to make triangles...and some think they actually do. This leads to some more really good discussion...Can you make a triangle? Why or why not? Of course the answer is no--and the reasons are a little too complicated for kindergartners to understand (the angles of a triangle must equal 180 degrees and the angles of a square are 90 degrees, which means you could only have 2 angles and a triangle needs 3...and even my head is about to explode right now!) The purpose of this activity is for the kids to explore and wonder...they will start to see that the shape of a square's corners do not fit in a triangle's corners (unless it's a right triangle). They are building a schema upon which they will add to in the coming years as they learn more and more about geometry! This is another activity similar to Day 1. I provide the kids with a blackline master of a triangle and pattern blocks. I challenge them to fill the triangle. The same rules apply--you cannot overlap shapes and there can be no white spaces remaining. I give them all the pattern blocks--even the orange squares and the skinny white parallelograms that won't fit. I let them try and try until they figure out that, because of the shape of the corners (the angles), they won't fit. Again--they are building that schema! I give the kids paper pattern blocks and have them glue them into their math journals. I also have them fill out a chart with the number of each shape they used. For share time, we take a gallery walk around the room to see the different combinations of shapes the kids used. This activity is based on the Investigations Fill the Hexagon game. I give the students a blackline master with several hexagons on it and pattern blocks. I challenge them to fill the hexagons in as many different ways as they can. Again--I let them figure out that the orange square and skinny white parallelogram aren't going to fit. This is a challenging activity, because the kids must find different ways to fill the hexagons. They get 2 or 3 quickly, but then they get stuck. It pushes them to really think! Here's a fun problem that the kids love. I actually hide 2 shapes in a basket and they get to guess what shapes they are. It is essential that kids have actual shapes to manipulate and count the sides when solving this problem. Most will not use an addition strategy at this point in the year...they will simply guess and check. They will choose 2 shapes and count the sides. If they do not equal 7, they will try again. It is interesting to see which kids will put both shapes back and start all over again from scratch, and which will keep one shape. Watch for the kids that figure out that they have too many or too few sides and choose their second shape accordingly. (a rhombus, a triangle) Gotta love that kindergarten spelling! When the kids have found a combination of shapes that equals 7 sides, I say, "That might be it...but it might not be. Can you find 2 more shapes that have 7 sides?" I have the kids record their answers in their math journals. For share time, we make a class chart recording the different combinations of shapes that have 7 sides. This year, one of my kids figured out that "the triangle always stays the same." He has very good computational fluency, and figured out that it was going to have to be a combination of 3 and 4 sides, and that a triangle is the only shape that has 3 sides! When we are all done, I open up the basket and reveal the shapes inside--the kids love to see whether or not they were right! So this is the same as yesterday's problem, but taking it a bit further--this time I do not tell them how many shapes I have--just that it's "some." So there are even more possible combinations. (square, hexagon) (hexagon, rhombus) (hexagon rectangle) (trapezoid, hexagon) We still haven't mastered organization when recording at this point! Again, during share time, we make a chart with the different combinations the kids thought of. During the big reveal, the kids discovered that I had included an oval, which added zero sides--they loved that! Check back tomorrow for some 2-D Shape Warm-up activities!